Heart and Sole: Hiking with a Friend. When nature's beauty abounds, it's great to be able to share the experience with a friend. The friend I had the honor of sharing two days of hiking with was Sandra Friend, author of the Florida Trail Guide and of the fantastic Florida Hikes! web site. I delayed my hiking in order to traverse the newly re-routed Lake Butler section of the Florida Trail with her. I could not have had a more knowledgeable and experienced guide with which to tackle this difficult section, nor could I have had better company. Sandra made what would have been a very trying day enjoyable. There were a few pretty sections of trail. An example is shown in the headline photo. But there were some pretty gnarly sections as well. The good part was limited to the southern couple miles, near highway 100. In the middle of this ten mile traverse of a new permanent easement through a private tract, the trail went downhill fast--and I'm not talking about elevation. It was blazed, but it was not trail. There were bogs and ditches full of deep water. There was thick brush over my head in the midst of the trail. There were nasty furrows made by machine planting of pines. It was trail built by non-hikers. It looks like they made a single pass with an ATV about a year ago when the trail was created and haven't been back since. The land is owned by (and if I understand correctly the trail was built by) the huge Plum Creek Timber company. How huge? They own six million acres of forest land in twenty states--415,000 acres in Florida alone. For comparison, Florida's national forest land is 1.1 million acres. And here she is immersing herself in her work--a stream we had to cross on a frosty morning with the temperature in the 30's. Brrrrrrrrrrrrrr! The frost was magical. We stopped to snap plenty of beauty shots. Now ... here's an example of why it's great to hike with a good guide. During a road walk I began to notice fragments of red clay amid the white sand. I didn't pay much attention to them--I was thinking 'broken-up bricks thrown down to help stabilize the road'. But Sandra enlightened me. 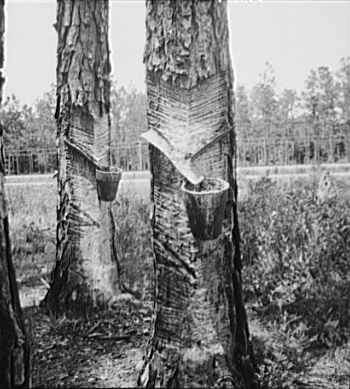 We were passing through a turpentine processing site, and the clay fragments were shards of broken 'Herty Cups' - cups nailed to Longleaf Pines in order to harvest the pitch and make turpentine. Charles Herty, a chemical engineer, invented a system to collect pine pitch that didn't kill the trees, then he founded the company that manufactured the collection cups. Here's a big chunk including the bottom of a Herty cup. Here's a public domain photo from about 1936 of the cups in action. Metal gutters were used to funnel pitch into the collecting cups. And here's a photo I took along the trail a few days ago of a tree with the gutters still in place. While I'm on the subject of sights and experiences I would have missed without Sandra, here is the big one--the 'psychedelic swamp scum' effect. I was walking past these wetlands paying them little to no attention, not seeing, thinking 'just another scummy swamp' when Sandra stops and exclaims, "Look at the rainbow effect! This only happens on bright sunny days in the winter." And there it was. Wow! Decay releases natural cypress oils that float on the surface in a uniform layer. It's a natural oil slick and it produces a kaleidoscope of pastel rainbow colors that change with changing angle of view. Back to the routing of the trail. We crossed over an old wooden bridge over Olustee Creek. It's rotting but still sturdy. The marked trail clearly called for hikers to wade the substantial creek. The trail corridor that Plum Creek granted the Florida Trail Association apparently makes no provision regarding hunting. They lease their land to hunt clubs. We passed several members of the local club out deer hunting with their dogs. These cute guys were eager to get out and get started. Every hunter we met was pleasant to talk to, and they radioed ahead to alert others that we were coming through, but with this much active hunting on the trail corridor, I would advise wearing blaze orange at all times throughout the year. It is no longer deer season, but on private land apparently the regulations don't apply. If you get a chance to hike with Sandra, do not pass it up. Ask plenty of questions and expect to be amazed! Thanks, Sandra. Here's the map of the hike through the Lake Butler section, with links to more photos. 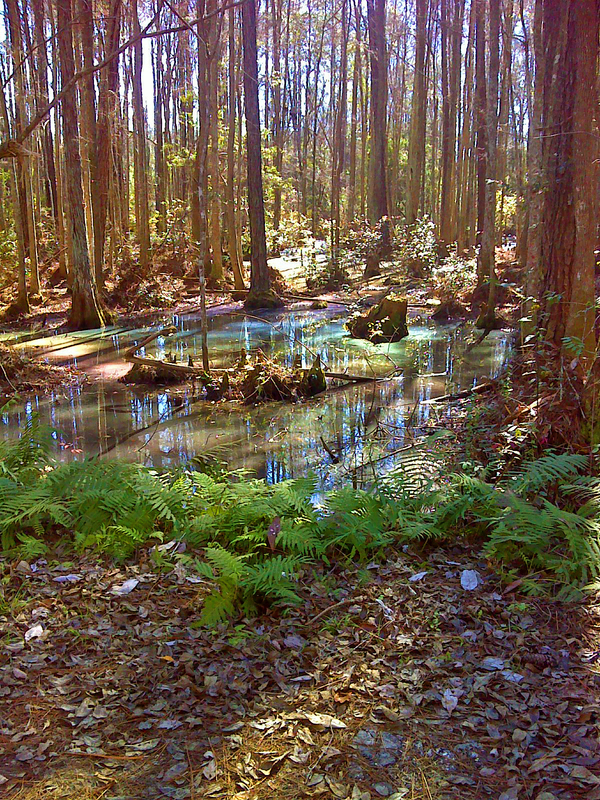 The rainbow in the swamp is very cool.